Take a departure from traditional coat hanging equipment and try some of these space-saving coat hanging equipment products. Use coat trees that are multi-purpose. For example, you may want to use a coat tree that doubles as an umbrella stand (as seen here). Or you may choose to use a coat tree with a hanger bar rather than hooks (not shown). Using solid aluminum hangers that match your coat tree are recommended because they accommodate any size, weight or shape jackets, and clothing. 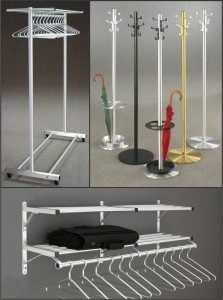 Wall mounted coat racks are a very convenient way to keep coats well organized using available wall space. For example, Glaro wall mounted coat racks are composed of 24”, 30”, and 36” modular sections that easily interconnect to create longer lengths. Wall mounted coat racks optimize the use of vertical space to maximize storage because these racks include one or two shelves depending on the model selected. By being able to control how much wall space you utilize and what configuration you choose, you will maximize space and create a clean pleasing look. Shelves can be mounted above or below coat racks or as one or several tiers on a wall to maximize storage capacity. In a recent press announcement, Glaro Inc. explained that in combination with placing shelving racks above the coat racks at any level on a wall, the products help to de-clutter spaces and improve storage capacity. In addition, accessibility is improved, for example, because racks can be mounted lower to meet the needs of young children.